This Quickstart guide is designed to show you how to play Harpoon4 in as short a time as possble. 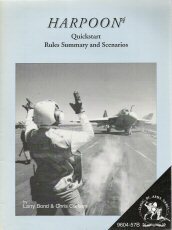 It includes a rules summary, introductory scenarios and the rules necessary for playing a simple battle. The charts and tables needed to play the game are not included here, so you cannot play a game without the full rules set. You can, however, read these rules and then play the game, using the full rules as a reference. These rules provided here are extracts from the rules booklet. Most of the explanation, and all of the illustrations, sidebars, and optional rules have been removed. They are repeated in the full rules set. You do not need this booklet to play the game if you have the rules book. Harpoon4 (H4) covers modern air, naval, and submarine warfare. It is a general-purpose simulation, and abstracts some detailed processes that are not the concern of a ship or formation commander.